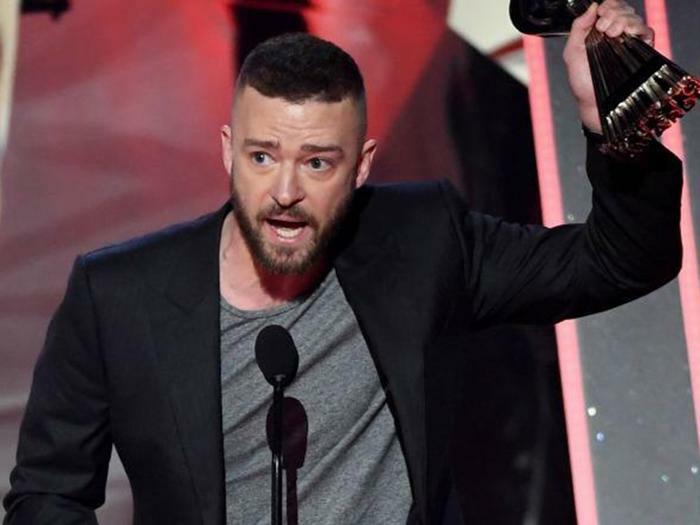 Justin Timberlake had a message for his fans about race and sexuality when he won the Song of the Year award Sunday night at the annual iHeartRadio Awards, hosted by the internet radio station iHeartRadio. The awards aired on the online station as well as on television channels owned by Turner Broadcasting Network. “If you are black, or you are brown, or you are gay, or you are lesbian, or you are trans, or maybe you’re just a sissy singer boy from Tennessee — anyone who has treated you unkindly, it’s only because they’re afraid or they have been taught to be afraid of how important you are," he said. "Because being different means you make a difference," he goes on. "So..." It's then when viewers who were watching the awards show on TNT, TBS, or truTV, the television stations that were broadcasting the program thanks to Turner Broadcasting Network, would have noticed a sudden silence. After several seconds, the sound comes back and the audience is heard cheering again. Several sites, including the popular news site Jezebel, published posts implying that Timberlake's speech was muted because of his supportive message for LGBTQ teens. Timberlake used his acceptance speech to "convey a message to LGBTQ youth, but that address was muted," Jezebel wrote. The site links to a clip showing the last 19 seconds of Timberlake's speech as it aired on the Turner Network channels. Again, only the last several seconds are muted. Reached by ConsumerAffairs, a spokesman from Turner Network provided a link to the speech as it originally aired on TNT, TBS, and truTV. Timberlake's message again be heard almost completely -- except for the last few seconds. The spokeswoman has an explanation for that. "Justin dropped an F-bomb," spokeswoman Marie Moore writes. "That’s the only thing muted." iHeartRadio, meanwhile, took a more creative approach to censoring the pop star's words. On Twitter, alongside a clip of Timberlake's speech, iHeartRadio posted: "Being different means you make the difference, so F#$& 'em!" Is Amazon using false information to censor book reviews?